In and not great for class A motor homes especially big rigs. Facility had poor quality amps. We couldn't get our heat to kick on because there wasn't enough juice in a 50 Amp spot. Park had terrible appeal. Our site had some junk in it that we had to move in order to get in our space. Noisy dogs. Felt cramped. Staff was friendly that was the only good thing. Fee should have been $35 per night instead of $75. Not worth the money to stay there. ?? Pros: -Easy to find. -Clean. -We were running late so they had our packet taped to the door with our lot info & bathroom lock codes. -The bathrooms are clean with good water pressure. -The staff was polite. -Close to shopping & tourist activities. Cons: -Lots very close together. Too close. Not room for use of slide AND awning. -Our pull through spot was not pull through for the size of motorhome we have. The pull through was long enough but there are people living there long term along the back of the pull through spots. Their vehicles on the lane greatly reduce maneuverability. There are also trailer houses at the back of the park so the lanes are closed off to driving down & around to the next lane. - We never did get the cable working. We were told, by a resident, that it is an older system that doesn't work with newer tvs (?). - No propane fire pits allowed. Frankly, the rvs are too close together for it to be safe anyway. -A very important feature for us is a safe pet area. They allow pets but their pet area is NOT safe. It is actually located outside the fence surrounding the property next to the busy main road. I trust good Sam ratings as a rule, but I find it hard to understand how this campground got the rating that it did. The sites are extremely small graveled spots, with very little room to maneuver or employ slide outs. I realize it is near the City, but the cost per site is more then we pay for ocean front sites! To say the least we were very disappointed. Why is this rated a 10 with zero reviews? There are a lot of permanently parked motorhomes. No trees. 15 minute drive to the Sonoma wine country. 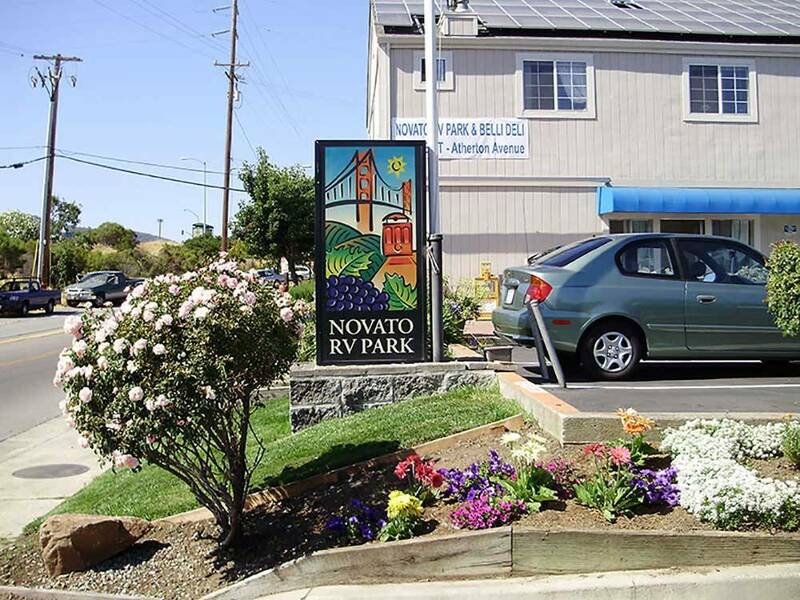 Close to Costco and Old Town Novato shops and restaurants.